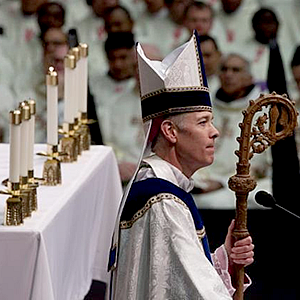 OST REVEREND Alexander K. Sample, currently Archbishop of Portland, wrote a Pastoral Letter on Sacred Music on 21 January 2013. As far as we can tell, the document is the clearest, most powerful (yet most concise) statement on Church Music written by any Catholic bishop. His Excellency treats every subject: Sacred vs. Secular, Instruments, Hymns, Church documents, Mass Propers, limited resources, etc. One often gets the impression that, as long as the written text of the music or song speaks about God, then it qualifies as “sacred music.” Given what has been articulated here, this is clearly not the case. As an example, the Gloria of the Mass set to a Polka beat or in the style of rock music is not sacred music. Why not? Because such styles of music, as delightful as they might be for the dance hall or a concert, do not possess all three of the intrinsic qualities of sanctity, artistic goodness (beauty) and universality proper to sacred music. It is important to keep in mind that we do not plan the Mass; the Church has already provided us with a plan. We prepare to celebrate the Mass. This is a subtle yet important distinction. The plan is found in the liturgical calendar and the official liturgical books: the Ordo, the Missal, the Lectionary and the Graduale. The Church recognizes an objective difference between sacred music and secular music. Despite the Church’s norms, the idea persists among some that the lyrics alone determine whether a song is sacred or secular, while the music is exempt from any liturgical criteria and may be of any style. This erroneous idea, which was alluded to earlier, is not supported by the Church’s norms either before or since the Second Vatican Council. Given all of this strong teaching from the Popes, the Second Vatican Council, and the U.S. Bishops, how is it that this ideal concerning Gregorian chant has not been realized in the Church? Far from enjoying a “pride of place” in the Church’s sacred liturgy, one rarely if ever hears Gregorian chant.